It’s Friday morning, 9:05am to be exact. I just pulled into work, running late as usual because I absolutely HAVE to stop and get my morning coffee. This particular morning I stopped at Tim Horton’s got a Pumpkin Spice Iced Capp with not one but TWO shots of espresso. So as I’m speed walking into the store, my customer is patiently waiting as she and Craig joke about me being all hopped up on caffeine already. I mean, how else do you expect me to make it through this day? It takes a few hours and by a few I mean 5. By the time the program design is approved it’s 3pm. This project takes at least 3 hours to print. The anxiety hits me like a ton of bricks, is this going to be ready before we close at 6pm? Catalina, our print production extraordinaire, stays to finish the job even though she’s scheduled to leave at 5pm. Remember, it’s Friday, no one wants to stay any later than they have to on Fridays. Shout out to Cat for being AWESOME! We love you, seriously. You should see the flowers at the funeral home. That’s the moment when I realize everything I do is more than worth it. There’s a reason I do the things I do, the way I do them. 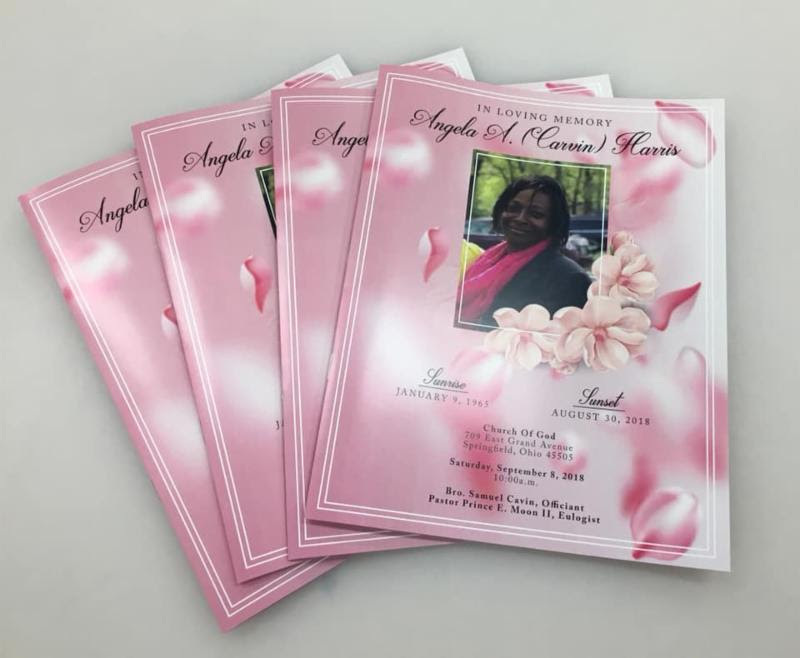 Without knowledge of their funeral service plans, by some sort of MIRACLE we’ll call it, the flowers at the funeral home perfectly matched the flowers on the programs. How? I don’t know, it was just a miracle.